Even though food is an essential part of people's lives, not much attention is paid to food as an important component of a nation's heritage and folklore. Nevertheless, food has had a defining role in the culture of the UAE. Special events such as weddings are celebrated with traditional food and other cultural features, while food also plays a functional role in religion. In fact a major change in the food culture of the Arabian region occurred when Islam reached here in the 7th Century. What we know of people's daily lives before that time has mainly been discovered through archaeological research. The earliest people lived predominantly along the coast and ate fish and shellfish. Large shell middens found along the Gulf coast are witness to this fact. At times these early men made forays to the inland plains to hunt for gazelles, hared and reptiles. In recent archaeological digs in Suffouh 2 (within the boundaries of Internet City) evidence was found of the large-scale slaughter of an early species of camel, as well as of oryx and gazelles. Grains, in the form of wheat, barley and sorghum, were already a food as long as 7000 years ago. These were made into porridge or ground to flour for making breads. The "tanur" ovens of the type that are still being used nowadays, have been excavated in several prehistoric sites in the UAE. The bread that was made in those days must have been prepared mainly from wild grains. From the Hijra (7th Century) up until 1960 (when oil became important) there are written and oral records of the local food culture. In the early nomadic days wheat was used to make unleavened bread ('abud) with a minimum of water (a precious commodity in desert life) and this bread was cooked in the embers of the campfire. Famous UAE dishes such as harees and aseeda also make use of wheat and wheat flour and date back to this time. During this period the daily activities of the majority of the people centered on the provision and processing of food. Subsistence occupations were herding of camels, sheep and goats, tending date gardens and small vegetable plantations, fishing and fish drying. More and more trades cam into existence: the pearl trade, charcoal burning, dhow building and copper works. For the export of locally produced goods overland camel routes developed as well as overseas trading in dhows. Accounts of the life of the bedouin of the desert were few and far between. The earliest Western visitor was a Bolognese adventurer, Ludovico di Varthema, who joined a haj caravan in 1503 and reached Yemen. The first scientific expedition was a Danish one in 1762, of which only one person of the six scientists survived. Carsten Niebuhr published his account of the ill-fated Arabia felix expedition ten years later. In this book the first detailed description of coffee cultivation appears. Coffee from Yemen was traded mainly from Aden and Mocha to the coffee houses of Europe. However, in Arabia coffee was already used much longer, as a coffee bean dated to be 1000 years old was recently found at archaeological digs in Kush, near Ras la Khaymah. Charles Doughty, traveling in 1876-1868 provided a more detailed account of the daily lives of the desert bedouin. The first crossing of the Rub al Khali (the Empty Quarter) was by Bertram Thomas in 1931, followed some twenty years later by the travels of Wilfred Thesiger. Some travelers reported lavish meals, where the rules of hospitality had obviously influenced the host to serve extra-ordinary meals. Doughty, Bertram and Thesiger who traveled with small parties of bedouin report much more basic and monotonous food. The main meal was taken in the evening after the milking. During traveling days they ate 'abud, the unleavened bread that was cooked in the fires. During rest periods in tribal encampments large quantities of unleavened bread (shirak or rukak) would be cooked on a saj – a convex metal sheet - over a fire. If small game had been hunted for meat, this would be thrown on the fire, skin and all, but if a beast was slaughtered for a special occasion it would be cooked in a large stewpot (jidda). In early days this was served with wheat, but when rice became available through import, this was preferred. As snacks during the rest of the day a few dates and some camel milk was all that was available. Dates (tamr) were very important for survival in the desert. They were readily available in every oasis, were easy to consume, unperishable, and economical to transport. They were also nutritious camel fodder. The bedouin made a special preserve of flour, dried dates and clarified butter (samn), heated together and kneaded into a solid mass. This ba-theeth was easy to carry and kept well on long journeys. Samn was prepared by churning fresh goat or sheep's milk in a skin which was inflated by blowing into it at regular intervals. The fresh butter (zibdeh) was heated with flour and spices. The samn was then stored in goatskins for commercial use and in the skin of the dhub (Spiny-tailed agame) for their own use. It was a major commercial product of the bedouin herdsmen and was sold to provide them with money to buy the staples they needed. These staples included, besides dates, flour, wheat and rice. Another milk product was yoghurt (laban) which was salted and drained to make mereesy or jamid. Soon after making it still resembled cheese, but after a while it would become rock-hard, and could be nibbled as a traveller's food or reconstituted with water after having been ground into a powder. Travelling in a hot, dry climate the bedouin needed fluids to replace what they lost during their exertions. Water was precious and often of poor quality. Only after sporadic heavy rains would a wadi flow and leave a few puddles remaining for some days. Wells or permanent water holes were deep, often up to 60 feet, and it was difficult to haul the water to the surface. If a large camel herd had to be watered, the bedouin would work in relays for many hours. The waiting camels would urinate around the wells and contaminate the water. The social drink of the Bedouin was coffee, qahwa. Green coffee beans were always freshly roasted in a mahmas (roasting spoon). The roast beans would be cooled in a wooden tray. 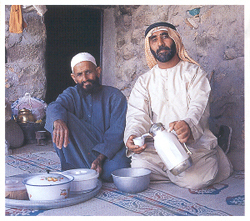 In some bedouin families the coffee was brewed in a clay medlah. It would be transferred to the classic beaked Arabian coffee pot of tinned copper or brass, called dalla and served in small ceramic cups, finjaan. It was often flavoured with cardamom. Another source of fluids was milk, haleeb. The nomadic Bedouin could choose between the milk from camels, goats or sheep. The first was much preferred and considered healthier, while the other two were used mainly to make butter and cheese. Camel milk has since been extensively researched and found to have medicinal properties (a remedy for diabetes and very high in vitamin C) besides its important nutritional value. The milk diet was however not satisfying in some respects; bedouin complained to the explorer Doughty and begged him for "Damascus kaak (biscuit), it is six weeks since I have chewed anything". Tea drinking was introduced at a relatively late stage. Doughty may be held responsible in part for its introduction as he carried supplies for his own consumption and several times offered it to bedouin who had not tasted it before. Bedouin existence depended on their herds and flocks. The camel was the supreme possession providing transport for man, milk for food and drink, meat, hair and hides and dung for fuel. Camels were wealth and would rarely be slaughtered for meat. Any camel meat usually came from the slaughter of surplus bull calves or injured or sick beasts. Goats and sheep could only be kept where water was available. They were kept primarily for milk and meat and also skins, hair and wool to make woven goods. The milk was mainly made into samn. Given the meatless monotony of the day-to-day meals, it is no surprise that an occasional hare or dhub was considered a delicacy. Hares and more rarely gazelles were hunted with both falcons and saluki dogs. The sandfish or skink that occurs in large numbers on sand dunes could be caught during their early morning sunbath, and was a popular addition to the diet. As late as the early 1980's I was invited to such a skink feast, when I had been found with my car stuck in the sand. The nomadic bedouin rarely had access to food of plant origin. Although there are many different species of plants in the desert, the Bedouin only used a few for food. There are several plants which have water storage capabilities in the roots. The roots of others, such as the Red thumb Cynomorion coccineum, were savoured as a kind of aspargaus. The desert truffle, faga, was also harvested and eaten on the relatively rare occasions when they appeared after early winter rains. Many plants were known to have medicinal or veterinary value and these were often collected. Calligonum comosum or "arta" was a plant that had many uses. The wood was used for fires, the young shoots as a salad green and the bright red fruits provided a spice for rice. The ubiquitous Asphodel lily was used to make dried cakes of boiled curdled milk (iqt), while the whole plant, boiled in water was used as a laxative. The two species of sorrel that occur in the Emirates were always collected as a vitamin C-rich salad green. It was only when local people visited the oasis that they could obtain good dates and other fruits such as the nabak, the fruit of the sidr tree (Zizyphus spina-christi). Of course the people living in the mountains had easier access to fruit and vegetables, while those on the coast had a great variety of fish and sometimes dugong or turtle meat in their diet. Although in recent times the residents of the Emirates have had access to an enormous selection of imported foods, some of the old traditional foods are still being prepared regularly. Traditional breads in the UAE are interesting. There are sweet and savoury forms: khamis, logaimat, regagg, and mahalah to name but a few. Unfortunately these traditional breads are in danger of disappearing because they are replaced by processed bread from supermarkets, or by khubz from immigrant artisans. Only a few of the older people still know the old bread making techniques, and young people living in a more hurried world do not have the patience to make their own bread. The same goes for some of the wheat and date dishes mentioned above. However the food traditions can be kept alive by those who are interested, since many of the old recipes have been collected and published in athe "Complete United Arab Emirates Cookbook" by Celia Ann Brock-Al Ansari. They can also be obtained from the website: www.uaeforever.company/dishes. Regagg (from ragga meaning thin and delicate) bread is made daily during Ramadan. It is also a popular winter-time bread, eaten fresh and warm from the griddle with oil drizzled over, then folded into pieces and eaten with fresh honey. Put flour and salt in a large bowl, slowly start adding the water and make a thick dough. Knead well. When the dough has lost much of its elasticity, work in around 1 cup more water at the end to make the dough slightly soft, yet pliable. Cover with a wet cloth and leave for 12 hours. Use a thick, ungreased iron or aluminum tortilla griddle for cooking the bread over the heat. Once it is hot, take a bowl of water, dip your hand in the water, then take a ball of dough. Place it on the outer edge of the griddle, then gently push it around the whole surface in a circular fashion, with a metal spatula or the side of your hand. Put any dough which drops off in the center of the griddle back into the bowl for the next bread to be baked. Once the outer edges are slightly golden, the bread is cooked. Remove from griddle with a spatula or blunt end of a knife. An Arab favourite, this dish is from the UAE and is served regularly with qahwa (Arabian coffee). Brown the flour in a skillet, stirring to avoid burning. Stone the dates and pull them apart with your hand. Place in a large mixing bowl and sprinkle the cardamom and sesame seeds over. Gradually add the samn and browned flour, a little at a time, working the ingredients in with the fingertips. When all is well blended, the mixture should resemble large biscuit crumbs. The mixture will keep for a week.